OCTOBER 4--With the start of his tax evasion trial three weeks away, actor Wesley Snipes just fired his high-powered legal team, a move that a federal judge yesterday blasted as a transparent ploy to secure a court continuance. 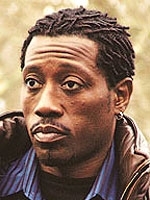 Claiming that his five-lawyer team was incompetent, Snipes yesterday filed a motion to continue his trial, which is set to open October 22 in U.S. District Court in Ocala, Florida. Until Snipes fired him, William Martin--who represents Michael Vick and Senator Larry Craig--headed a five-lawyer team defending Snipes on felony tax and conspiracy charges. But Snipes's request for a trial delay was almost immediately rejected by Judge William Terrell Hodges, who yesterday issued a blistering order noting that, "This series of events would lead any reasonable person to suspect that the defendant's dismissal of able counsel is nothing more than a ploy designed to force a continuance of the trial." A copy of Hodges's order can be found here. In his motion for a continuance, Snipes--who is now represented by a Wisconsin lawyer who has previously represented tax protesters--claimed that Martin & Co. lacked diligence in their pre-trial preparations, and that the "scope and prejudicial effect of this pervasive ineffective assistance of counsel" only recently came to Snipes's attention.